If you want your site to be optimized for search engine rankings, you need the ability to change page titles, meta descriptions, and a few other critical aspects. We make it super simple and easy to change any page’s SEO. 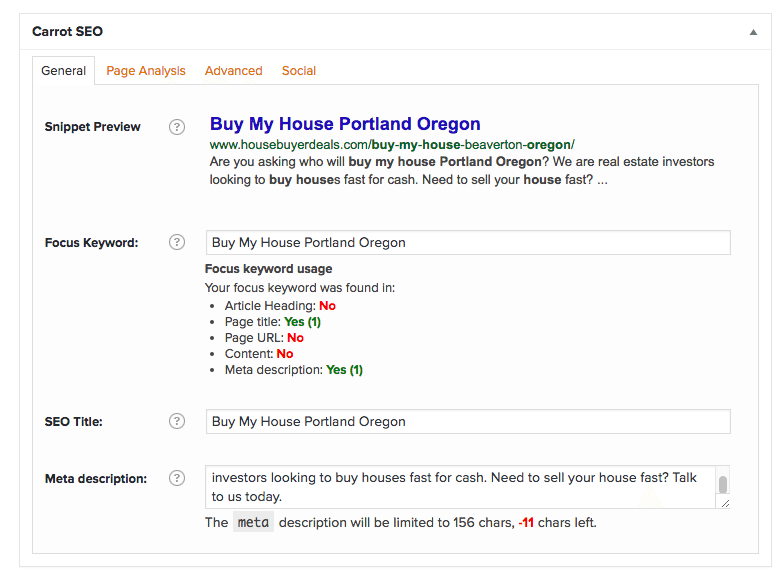 Carrot’s SEO Tool Makes Ranking Your Real Estate Investor Website Easy. Whether you are new to SEO or an expert, you will find yourself optimizing page titles and meta data. Need a crash course on these SEO activities? Check this out. At the end of the day, we realized that we needed to make it incredibly easy to change the Page Title of your real estate webpages. Each page, post, property listing, landing page and every other type of content on a Carrot site allows you to make quick changes on the fly. Snippet Preview: Quickly shows you how your page will appear in Google’s search engine rankings. 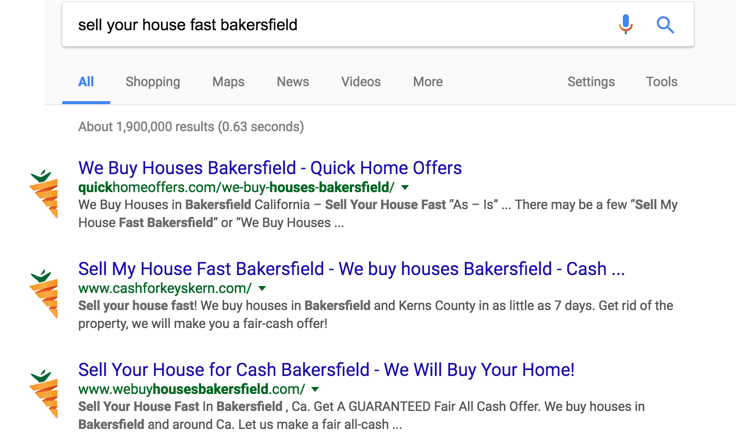 Focus Keyword: Quickly analyzes if the keyword you want to rank for is being used in the content on the page and title. SEO Title: Allows you to change the title that a user sees when searching. Make this compelling and contain your keyword if possible. Meta Description: Quickly adjust the content that goes below the URL in the search engine. Make this compelling so people click your link. That’s alright. We have built in suggestions that show you what you can to do your content to make your page have a better chance of ranking in Google. We take it a step further by offering top notch resources like our SEO Bible, and Content Marketing Roadmap. Not what sure to write about? Here are 101 blog post suggestions. If you want to become an SEO expert we have a training which allows you to learn everything we know about ranking sites at the top spot of Google. 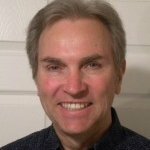 Thanks a bunch for helping tweak the SEO for my site! 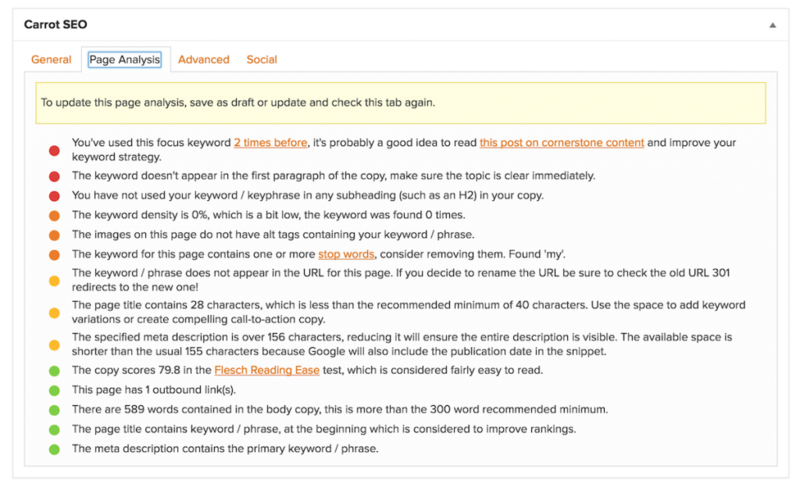 I am back on the first page for at least 3 keyword phrases that I tested. I use four Carrot sites. The platform works for me. I have generated over 1000 leads (Buyer, Seller, Rent To Own). Their support is awesome and they know what they are doing. 99% of my questions are answered within minutes so I can keep moving. There's a reason more top investor use InvestorCarrot's platform. It works.